is also increasing competition among writers trying to sell shows. good writer – and become an even better writer while you’re at it. She's right. As my grandfather used to say, "You can't catch fish with your line in the boat" (it's amazing how many different situations I can apply that advice to, just like he did). That's why I am always working on several things at once. Today is a good example. I had a pitch at FX, I did some research for my next "Monk" novel (which is due in April), I wrote five pages of my "standalone" novel, got notes on a spec script I've optioned to some producers, and I started sketching out some ideas for a pitch I have on the 13th. I have my professional ups and downs, and personal ones as well, but no matter what I am always writing something. Even when I had two broken arms. It's how I stay sane and it's probably how I stay in business. Snead’s Screed — Dishonest or Stupid? I don't know whether Louise Snead, publisher of Affaire De Coeur, is dishonest or stupid or self-deluded..or a little of all three. As you may recall, I took her magazine to task for her unethical editorial practices (accepting advertisements in exchange for reviews) and for an outrageously unethical conflict of interest (her advertising director co-owns a sham publishing company that received cover stories, features, and extraordinarily positive reviews in the magazine). In subsequent public comments on this blog and others, Snead and Bonny Kirby, her advertising director, unapologetically confirmed both the reviews-tied-to-advertising policy and the conflict-of-interest and defended them as appropriate conduct. These are very serious, slanderous allegations, not even borne out by his own review. He didn't take out an ad and his publisher has never taken out ads either, so how did he manage to get a five star review if what he allegesis true? To compliment your ad and review we also offer interviews or articles. publication unless it is done in association with an ad. I was under the impression people could not simply tell lies on the Internet as if they were gospel. I was wrong. But apparently she's under the impression that it's okay to tell lies in a magazine, since that is what she's doing. She's denying an advertising-for-reviews practice that both she and Kirby have previously defended in comments they posted here and on other blogs. Did she think no one would notice? But of equal surprise was how disinterested in the truth some readers are. Some of the AdC staff and I responded to Goldberg's allegations with the correct facts, borne out by statistics which anyone can gather from our magazines, only to be completely ignored. a product and reviews that are as good and unbiased as we can make then. If that were true, she would have informed readers that all the Light Sword books that were reviewed — all but one of which received four stars or better — were published by a company co-owned by AdC's advertising director. If that were true, she would have informed readers in the cover stories about Light Sword that the company they were raving about was co-owned by an AdC executive. But those facts, representing an outrageous conflict-of-interest and bias, were not disclosed. And yet, Sneed expected publishers to line up to defend AdC's dubious editorial integrity. A greater revelation is how cowardly some people are. AdC reviews over 100 books per issue, the vast majority of which do not have ads in the magazine. Hundreds of authors and publishers could have stepped forward and declared that Goldberg's opinions were false but sadly, only a few authors did — some with qualified statements — and only one publisher stepped up to the plate, saying that we review dozens of their books and they've never taken out an ad. And even then, she did it anonymously. only wrong here was that I dared to call her on it. Parkway or a matinee performance of “Mamma Mia!” But things that he really, really doesn’t want to talk about. Just leave it alone. O.K.? Just leave it. seven-six in Brooklyn or the one in a split-level out on Long Island. Timmy, Tommy, Sean, whatever your name is? She can’t take it anymore. Timmy, Tommy, Sean, or whatever leaves to see some more things. ENOUGH REFERENCES TO IRISH AMERICA TO DRIVE YOU TO DRINK. But that’s a stereotype. Yeah, but I’m Irish-American, so it’s O.K. Or is it? Just leave it alone. Just leave it. "How much of your books does Tony Shalhoub write?" "He doesn't write any of part of them," I replied. "Then why is his face on the cover?" "Because he plays Adrian Monk on the TV show." She narrowed her eyes at me. "Don't you think that's deceiving readers?" Another woman came up to me later in the day and said "Your books are very funny. Why aren't you as funny in person?" Before my screenwriting seminar, a woman approached me and said "I'd like to attend your class but there's a more interesting one at the same time." Other than those comments, it has been a great day…a long one, and tiring, but a lot of fun anyway. And I had the pleasure of signing with my friend Michael Connelly and introducing him as our keynote speaker. He was an engaging, self-effacing, and inspirational speaker, as always. Tomorrow I have two more classes/seminars and then I take a late flight back to Los Angeles. This was the first day of the South Carolina Writer's Conference and I was kept pretty busy. I managed to sneak in a long walk on the beach before the rains came (which have lasted all day and into the night) and my three-hour "Breaking Into TV Writing" seminar. I had a great class of aspiring writers and don't have a single stupid question to share with you — though one guy did walk out when I told him I wasn't interested in reading his scripts or his novel-in-progress. I am constantly surprised by how many people read this blog — three people came up and chatted with me about posts they enjoyed or things that they've learned. One woman thanked me for steering her away from making a very expensive mistake with a vanity press. She was so anxious to get her novel published and the vanity press seemed like an attractive short cut to her — but then she realized it was her desperation talking and not her good sense. It made me feel really good to know I saved at least one person from those scammers. 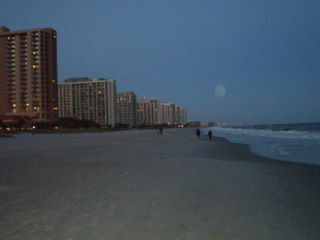 I'm here in Myrtle Beach. I almost missed my flight — a brush fire shutdown the 405 freeway and I had to go around it using surface streets. I was one of the last people to get on board my plane. Other than that, it was an uneventful voyage. Tonight, I took a long walk on the beach and pigged out at a local fried fish place with my buddy James O. Born (who told me about his new scifi novel, written as "James O'Neill") and some of the other attendees. Tomorrow morning, the conference starts at 8 so I am off to bed. Night night! I am on my way to Myrtle Beach, SC to speak & teach at the South Carolina Writer's Conference. Other speakers/teachers include authors Michael Connelly and James O. 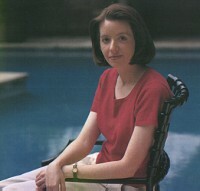 Born and editors from St. Martins, HarperCollins, Little Brown, Random House and Thomas Dunne as well as a slew of agents. There's also going to be a rep there from Book Surge, and I've already warned the conference that I will be strongly advising aspiring writers to avoid vanity presses. I've got to get up at 3:30 in the morning to make my flight…and since I usually go to bed around 1 or 2, I might just forgo sleep altogether and try to nap on the plane. 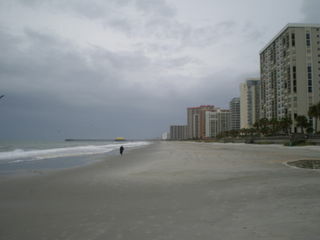 I've never been to Myrtle Beach and I'm really looking forward to it. I have a pretty busy schedule over the next four days, so I don't know if I will have a chance to post while I am there. The London Times lists some of the worst James Bond movie moments. I disagree with a lot of their choices, especially when there are so many truly awful moments to choose from. For me, the worst moments were in "Moonraker" (Jaws flapping his arms, trying to fly as he fell from an airplane; Bond riding a horse to the theme from "The Magnificent Seven"), "A View to a Kill" (Bond skiing across an ice-lake to a Beach Boys song; getting into bed with Grace Jones and looking like a dirty old man), "On Her Majesty's Secret Service" (007's arch-nemesis Blofeld doesn't recognize Bond because he's wearing a kilt! ), "Diamonds Are Forever" (Bond tooling around the desert in a moon buggy), and "Die Another Day" (the invisible car and a ridiculous CGI Bond surfing a tidal wave). I've taught writing a lot in the last few years — UCLA Extension courses, Writers University online courses, week-long seminars abroad, conference workshops, speaking engagements, etc. One of the many reasons I enjoy doing it is that talking about craft invigorates my own writing and helps me take a fresh look at what I am doing. That point was underscored for me this week. I have been reading & critiquing manuscripts and screenplays for the South Carolina Writers Conference, which I am attending this weekend. Many of the manuscripts have serious structural problems, point-of-view issues, and are bogged down in insanely dull (and unnecessary) exposition & backstory. The stories never actually get started. At the same time, I have been wrestling with the first 40 or so pages of a "standalone" crime novel that I'm writing. I am working with a much sketchier outline than I usually do…I thought it might be exciting for me since this isn't a "whodunit" and I pretty much know where I'm going. Maybe that's a mistake, because the writing hasn't been going well. I find myself continually rewriting my work and not getting anywhere. I was in the midst critiquing one of the student manuscripts, and writing down my advice, when it hit me — I was making the same mistakes in my work that he was in his. I was smothering the drama and conflict in exposition, I wasn't giving the reader a chance to get invested in the characters or the story. I wasn't following that old screenwriting adage — show, don't tell. I needed to get the story started, then carefully dole out the necessary exposition in bits and pieces in ways that reveal character and generate some conflict. Yesterday I went back and rewrote my first 40 pages yet again…dramatizing key moments that I'd buried in exposition…and suddenly it all began to work. I felt a rhythm to the writing that was missing before. The story had a pulse, a forward momentum now…and it has carried me through my writing today. That's not to say I won't have trouble again. I'm sure I will. I have been in this situation before on other books and scripts. But what can be great about teaching, at least for me, is that it can give you the distance and perspective you need on your own work.